Have you noticed that I've dropped the "40" from my blog post titles for this year long challenge now? I've decided that using 40 in the title is misleading and false given that now only about half the number of girls are participating. Check out the inlinkz, I bet the final number is closer to 20 than 40. 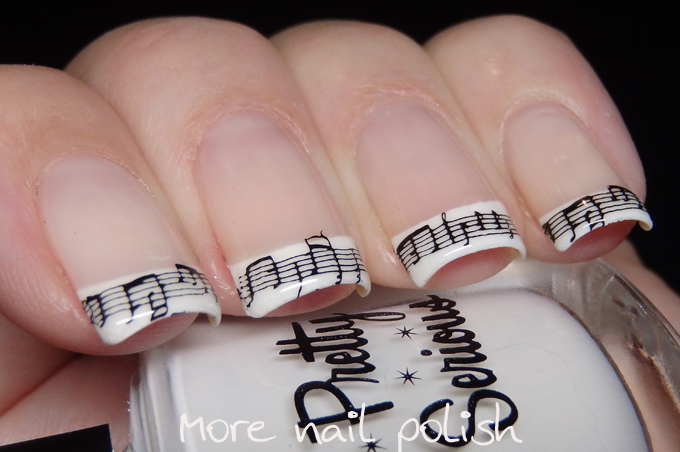 Anyway, this week's prompt for the '40' Great Nail Art Ideas challenge is Music, a pretty easy prompt really, especially after tackling a whole week of 'whimsy' last week. For this very simple mani I actually started with a basic French. 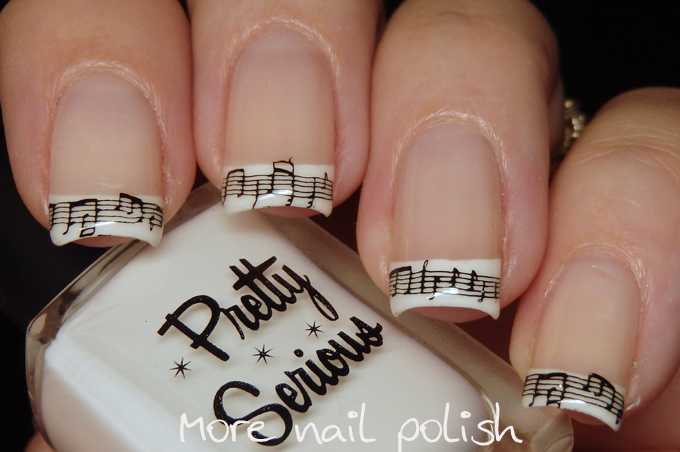 I don't remember when I last did a french manicure. I did they white tip using some tip guides and then did two coats of OPI Don't touch my tutu, for that soft milky see through look. 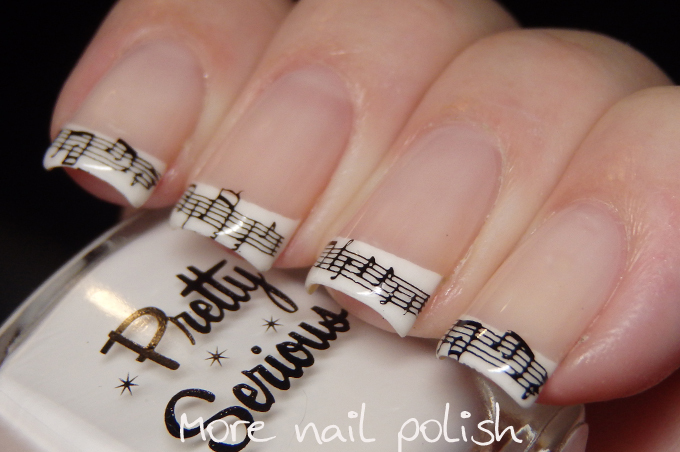 To finish it off with a music theme, I stamped some music bars onto the french tip. The stamping image is from Konad M73 plate. The day after putting these on, which was also the day before I took my son to hospital this week to get his tonsils out, I had a massive break on my ring finger. I literally took off the entire white tip of this mani. I was pretty pissed that I broke it, and I just caught it on a blanket for goodness sake. Would you believe for the couple of days I was at the hospital with my son that I actually stuck on a false nail so it didn't look so hideous. No one else noticed of course, except it was so huge and wide compared to my other nails that it felt like it had a flashing neon light on it drawing everyone's attention to it. I have since built out a tip using gel polish and acrylic powder, lets see how long that last for. The built tip should last quite well. 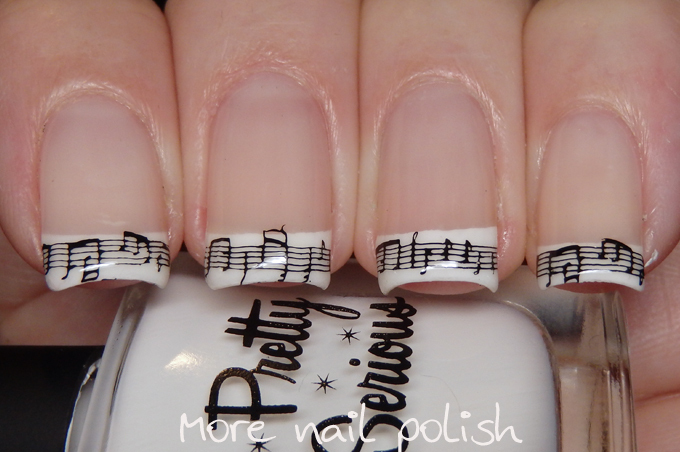 This nail art is awesome!